Games4Escape Easter Bunny Escape 2 info about the game-Games2Rule. 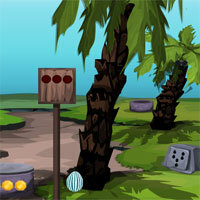 G4E Easter Bunny Escape 2 is a point and clicks type game developed by Games4escape. In this game, a Bunny entered the festival village, unfortunately, cage got locked. you have to find a way to bring the bunny out from the cage with the help of useful objects to interact with them and solve the puzzles.